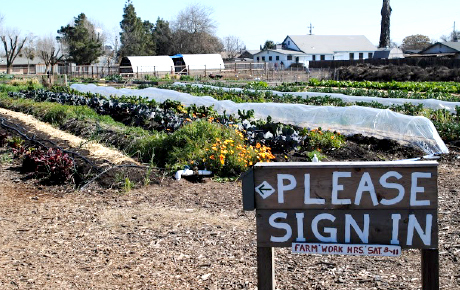 PUENTES » Now is Your Chance to Learn About Urban Farming! Now is Your Chance to Learn About Urban Farming! PUENTES is launching our Natural Urban Farming Practitioner program! Natural Urban Farming, or nurbaculture, is the practice of recovering broken cultural connections to the land, increasing food security, and providing economic opportunities in farming by using ecologically sustainable farming techniques to cultivate, process, and distribute food in or around villages, towns, cities or other concentrations of population. As the concept and practice of urban farming and gardening has become increasingly popular, thousands of people throughout the US, and especially in California, have taken organic agriculture and permaculture certification courses and begun growing food in their backyards and neighborhoods. Others also want to put their newfound skills to work in earning a living independently or by contributing to economically productive farming enterprises. The PUENTES’ Natural Urban Farming Practitioner Program aspires to provide technical training in nurbaculture techniques and practices, as well as management and business skills training, in order to transform participants into urban farmers. Click on the link below for more information and to download an application for the program.